MapInstall 4.2.0 is broken. You will get it by updating to Basecamp 4.7.0 - however also individual update can happen. MapInstall 4.3.2 (part of Basecamp 4.8.4) is fixed - but so far only available to Apple Mac OS x users - not for Windows. The big problem is that Basecamp 4.7.0 also ships an updated version of Garmin MapInstall - and that version is broken in so far that it does not reliably/correctly send any maps in .img format anymore! This also applies to original older garmin maps. On Windows instead of the actual map - only the overview map is sent - so you will have a nearly "empty" map. ATTENTION - you need to first uninstall Garmin Basecamp, Garmin MapInstall, Garmin Express, and any other Garmin Software via Windows "Add or Remove Software" except Garmin Mapsource (if you have Mapsource installed, do not delete it because you might lose data saved in Mapsource). As the user data of Garmin Basecamp, Garmin Express or Garmin Homeport is saved in a separate database - you will not lose it.Then Install Basecamp 4.6.2. If you simply install 4.6.2 without uninstalling Garmin Basecamp and Garmin Express, Mapinstall will not be downgraded. Alternatively if you are afraid about losing data - you could first delete the content from C:\Program Files (x86)\Garmin\MapInstall\ folder (but not of subfolders) - then ONLY uninstall Garmin Basecamp via Windows system "Add or remove programs" - then Install Basecamp 4.6.2.
f) Use the create_gmapsupp_img_with_mkgmap.bat Script - this will only work for Maps <4GB however. And you can only install full maps. It is found in the map Installation folder. It requires Java JDK installation and java added to Windows path. Alternatively you can use the create_gmapsupp_img.bat Script - however mind that address search is not possible then. If you chose to downgrade Basecamp and already created tracks/routes with 4.7.0 you will need to restore them. While updating/downgrading does not delete any of your data - routes/tracks that you planned with Basecamp 4.7.0 will not appear in Basecamp 4.6.2 after downgrade - only routes/tracks that you had planned before the 4.7.0 update will show up. Deinstall All Garmin tools/programs via Windows "Change or Remove a Program". Then delete the Garmin Folder in "C:\Program Files (x86)". Then Reinstall all Garmin tools/Programs and make sure to use old enough versions (as linked here). 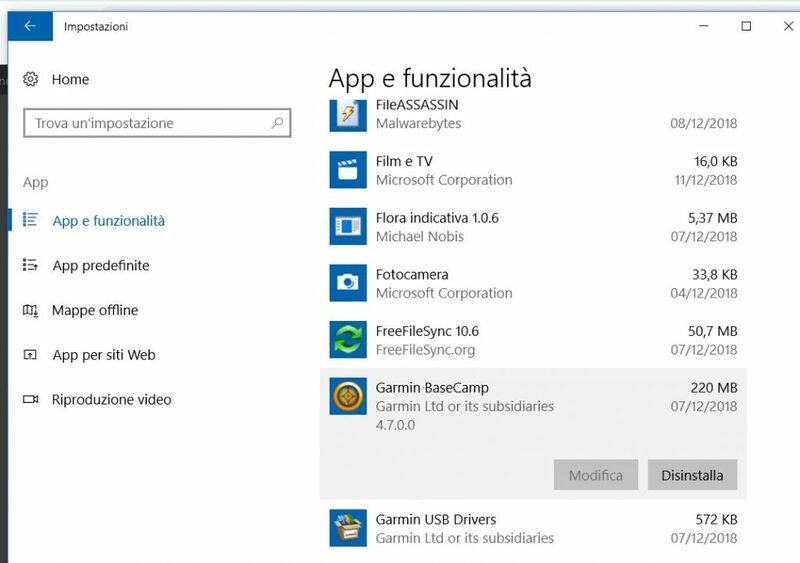 IMHO you do not need to clean the registry of any Garmin entry, nor do you need to remove any Garmin folders that are somewhere else then Program Files folders (so far all Garmin tools are x86 and not 64 bit - it's possible this will change in future - so then also delete Garmin folder inside "C:\Program Files". You can still downgrade to 4.6.3 for the missing functionality. However MapInstall 4.3.2 or later is fixed (at least with the download directly from Garmin or from here - the Mac Appstore version sometimes does not update MapInstall) - so just make sure not to use Basecamp 4.7. and if you upgrade to Basecamp 4.8.4 or later. While windows users have good alternatives to Garmin MapInstall - on OS x the only real alternative is to use mkgmap.jar to create gmapsupp.img files. That is not so easy to do and requires Java JDK properly configured. However MapInstall 4.3.2 is fixed - so either downgrade to Basecamp 4.6.3 or upgrade to Basecamp 4.8.4 or later. c) Downgrade to Basecamp 4.6.3 - To do so first Uninstall Garmin Basecamp 4.7.0 Then make sure that also Garmin MapInstall installation folder is removed/empty - If not uninstall all other Garmin software too. Then install Basecamp 4.6.3.
d) You could try to simply Install Garmin MapInstall 4.1.1. - I'm not sure if this works by just executing the installer. I think not. That means you first have to uninstall Mapinstall 4.2.0 - then Install only MapInstall 4.1.1 / MapManager 4.1.1. That way you could keep Basecamp 4.7.0 but I don't know why you would like to do so as Basecamp 4.7.0 is only a regression. 29 comments to Do NOT Update to Basecamp 4.7.0 – MapInstall 4.2.0 is broken! Hallo, ich versuche verzweifelt die Karte “Seychellen” herunter zu laden. Auf Basecamp (die Version 4.6.2) funktioniert das auch und ich kann die Karte wunderbar anschauen, aber ich bekomme die Karte nicht auf meinen Oregon 450 geladen. Habe es dann mit der Karte “Baden-Württemberg” versucht, da klappt das ohne Probleme. Irgendeine Idee was ich da falsch mache? Weshalb – gibt es eine Fehlermeldung? Hört sich für mich so an als ob du OSx benutzt und MapInstall 4.2.0 (trotz Basecamp 4.6.2). Ich sehe gerade, es gibt seit dem 6. März 2019 eine neue Version des Garmin BaseCamp, 4.8.3 (64 Bit). Besteht da der Fehler in Bezug auf MapInstall weiterhin? Da es die Version bisher nur für Mac OSx gibt – kann ich dazu noch nichts sagen! Vielen Dank für den Hinweis – ich werde es mal beobachten! Bei dem Changelog weiß ich nicht ob 4.8.x auch für Windows erscheint! Würde mich auch interessiern. Gibts da schon Neuigkeiten? Ich konnte seit einiger Zeit keine Karte mehr auf mein Etrex 20 übertragen. Ich habe viele Stunden investiert, um den Fehler zu finden und dachte sogar schon über ein neues Navi nach, bis ich heute hier die Lösung erfuhr: Auch ich wurde ein Opfer der defekten Version 4.2.0 von MapInstall. Habe jetzt nach Anleitung b) die Vorgängerversion installiert – und siehe, ich kann endlich wieder Karten übertragen. Vielen Dank für den Hinweis. Noch ein Hinweis von mir: MapInstall ließ sich bei mir nicht “normal” über die Systemsteuerung deinstallieren – es gab dafür keinen Eintrag. Ich habe dann einfach die .exe im C:\Garmin Verzeichnis gelöscht. Bei der Installation von Basecamp 4.6.2 wird dann an der selben Stelle die korrekt funktionierende Version von MapInstall installiert. Da hab ich teils von Problemen gehört – daher empfehle ich den kompletten Ordnerinhalt zu löschen – aber ohne Unterordner. Aber ja – meist reicht es die .exe zu löschen. (wenn danach dll Fehler kommen – dann halt ganzen Ordner ohne Unterordner). I see your maps. So I uninstalled base cap and map install and webupdater usbdrivers (no training center and trekmap italia 2V) I instlled an old version of base camp and I tried to install again mapinstall 4.0 but when I try to open it it doesn’t work and it tells me “incorrect language dll file”. What do I have to do?. Now pratically I have no more Installmap. I cannot see your maps on my new 62s. Hi Marco – that usually happens if the uninstall is not correct – you could try if Installing MapInstal via Installing Basecamp 4.6.2 works – if not you could resort to MapSource instead (or also clean the registry from any Garmin leftovers (except maps). I confirm it worked for me. I tested it with the whole european map. Thank you. Usually deleting the folder and reinstalling the old version works – only if you have dll or SMI errors on reinstallation – then you have to Uninstall all Garmin tools first. Mapinstall only shows in system if it was installed individually, and not as part of Basecamp. Ich mache kein Update mehr!!!! I would never use the print function of Basecamp. The best thing to do is take screenshots from Basecamp on a high resolution monitor (if you don’t have one I don’t know if you could create a scrollable virtual 4k monitor and take a screenshot of the full display as if you had a 4k screen). My recently downloaded openmtb map is also not in the list of maps….from the maps menu on my unit. When I look in the Garmin folder on the unit I see that the openmtb map is there….named “gmapsupp.img”. I heading on a hiking trip to Italy soon….and would really like to have my gps & maps. Hi Jim, that’s a different thing. You did not read carefully on the download instructions. The Montana does not work with free unicode maps – you have to download the the non unicode map of that country. Yes…..you are correct….turns out I had 2 different problems….the basecamp problem and the Unicode mistake. Thanks very much! Kann es sein dass du ein extrem altes Air hast – evtl ist für deine OSx Version 4.2.4 die höchste Version? Oder hast du etwa die Version von MapInstall abgelesen? Und nein – wenn dein OSx nicht extrem alt ist – kannst du die 4.6.3 einfach runterladen und drüberinstallieren (oder bei 4.2.4. bleiben wenn es die denn tastsächlich ist). Bin gerade in Ligurien und hatte schon befürchtet die Touren einschränken zu müssen. Habe Variante a) gewählt. Nun funktioniert alles. Danke! Wenn ich nicht schon gespendet hätte, hätte ich dies spätestens jetzt getan. Super! Grazie Felix, come sempre aggiornato e competente. Thanks Felix, as always updated and competent. Grrrr Garmin updates and GDPR. On my Mac mini, playing around and getting v annoyed I eventually uninstalled the latest version of Mapinstall and downloaded the one you recommend without uninstalling Basecamp. At the moment the map transfer seems to work most of the time, not always but mostly. I check up on the GPS to make sure, it takes time but then I’m sure its loaded correctly. Sometimes it doesn’t load the contours and other times it didn’t load the rest of the info. At least it works sometimes! I also rang Garmin UK and complained and the operator said he hadn’t heard of this but has noted it. Keep up the great work and lets hope Garmin rectify Mapinstall. Hi Nick, you need to make sure to select maps by holding the mouse button and dragging over the WHOLE area you need – on the outside only contours or only map will stand over for some distance (noticeable by lighter shading when selected in MapInstall). Also make sure never to select by single clicking – then you only get either maps or contourlines.